As if growing consumer and government mistrust weren't serious enough, major advertisers have come to the realization that their expenditures may be wasted. They are cutting budgets and demanding more accountability. Add to the list of people frustrated with Facebook Inc. FB -3.31% and Google a quiet but hugely influential group—the people who pay the bills. In the past year and a half, the two firms have had one run-in after another with advertisers. Procter & Gamble Co. PG +0.21% was among many companies that boycotted Google’s YouTube when they discovered ads were running before extremist and racist videos. Marketers pushed Facebook to provide more credible data about how many people actually view ads on their platforms, after the social giant acknowledged mistakes in its numbers. Now there’s the revelation that data on tens of millions of Facebook users were improperly accessed by Cambridge Analytica, a firm tied to Donald Trump’s 2016 presidential campaign. That has sparked anxiety among some marketers, including over whether their own data on Facebook are safe. Madison Avenue’s increasing uneasiness with the platforms and its moves to push back aggressively are fundamentally reshaping the relationship. Advertisers’ broad push for changes has played out in behind-the-scenes dust-ups, veiled and overt threats and advertising boycotts, and has extracted some concessions from the tech giants. Among the leaders is P&G, the world’s largest advertiser. Many companies are actively policing their ad purchases to ensure they avoid objectionable or irrelevant content. Some are cutting budgets. And they are demanding far more transparency from Google and Facebook about the performance of their ad campaigns to make sure they aren’t wasting money. Advertisers have poured huge sums into the two tech giants over the past decade, lured by their huge audiences and ability to target ads based on reams of consumer data. Facebook and Alphabet Inc.’s GOOGL -0.09% Google are known in the industry as a “duopoly,” with overwhelming dominance of the U.S. digital ad marketplace, which is expected to reach $107 billion this year. Yet both firms are now on the defensive about the role they played in the 2016 election and on their broader role in society. The latest controversy over the mishandling of Facebook user data has prompted a handful of small advertisers, including wireless speaker company Sonos and auto-parts chain Pep Boys, to temporarily suspend spending on the platform. Some advertisers want to ensure that the data they upload to Facebook on their customers—a tactic used to target ads at their desired audiences—are protected. And they are watching to see if the scandal reduces Facebook’s use by consumers. Facebook has moved to reassure top ad executives in recent days. P&G said it is poised to return to YouTube on much stricter terms. It will hand pick a list of acceptable channels to advertise on rather than relying solely on Google’s algorithm, which tries to match viewers with the advertiser’s target audience. “We realized we can’t count on them. We have to take this into our own hands,” said P&G Chief Brand Officer Marc Pritchard. So far, there’s no sign of financial damage to the tech companies, and they remain in a commanding position. Last year, Facebook totaled $39.9 billion in global ad revenue, up 49% from a year earlier, and the YouTube controversy didn’t appear to make a dent at Google, where ad revenue grew 20% to $95 billion. 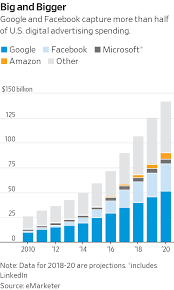 Advertisers are beginning to direct more digital dollars to Amazon.com Inc., Snap Inc. and others, but they still see enormous value in the duopoly, and the lion’s share of their spending goes to them. The latest data from research firm eMarketer showed that Google and Facebook’s combined U.S. digital ad market share will drop for the first time this year to 56.8% from 58.5% last year. No other digital player is expected to top 5% this year, however, including Microsoft Corp. , Verizon Communications Inc. and Amazon. P&G’s pushback began more than two years ago. In February 2016, Mr. Pritchard went to Silicon Valley and met with executives from tech companies including Facebook and Google to complain about what he saw as a declining return on investment from digital ads. Mr. Pritchard wanted to know if ads were hitting the right target and how long they were being viewed, and he wanted the platforms’ data to be verified by an accredited independent third party, similar to the role Nielsen plays in television ratings, people familiar with the meetings said. During a tense session at Google’s Mountain View, Calif., headquarters, Google’s chief business officer, Philipp Schindler, told Mr. Pritchard that P&G’s rivals were spending billions of dollars without getting accredited third-party measurement data, according to a person familiar with the meeting. Mr. Pritchard told Mr. Schindler that P&G would stop spending if Google didn’t step up. “Hundreds of millions of dollars may not seem like a lot to you, but it’s a lot to us,” said Mr. Pritchard, according to the person’s account. Several months later, it was Facebook’s turn to take the heat. In August 2016, the company disclosed in a post on its “Advertiser Help Center” that its metric for the average time users spend watching videos was artificially inflated, because it was only counting views of more than three seconds. Facebook told advertising giant Publicis Groupe that average video viewing time was likely overestimated by 60% to 80%. Other miscues followed. Facebook fixed the problems as they arose and said they didn’t affect billing, but trust with advertisers had frayed. “The days of giving digital a pass are over—it’s time to grow up,” Mr. Pritchard said publicly at an industry trade group meeting in January 2017. The following month, at a meeting of the Association of National Advertisers, the group wanted to know when Google and Facebook would allow the industry’s measurement watchdog, the Media Rating Council, to audit some of their metrics. Instead, Facebook executives including Carolyn Everson, vice president for global marketing solutions, launched into a presentation about how video ads were effective on Facebook, even if users only watched them for a very short time, said people familiar with the meeting, frustrating some attendees. “If our boards come to us and ask us, ‘Do you know where these dollars went’ and we cannot confirm it, we have a problem and therefore you do,” said Deborah Wahl, who was then U.S. marketing chief of McDonald’s Corp. , according to one of those people. Facebook executives got the message and laid out a plan to give more measurement data to third-party companies and promised to undergo an audit of its measurement processes. Facebook said it is working to help advertisers reach the right audiences and drive sales, but that it is limited in how much information it can give because of privacy concerns. “Our goal with every business advertising on Facebook is to help deliver a meaningful return on investment,” said David Fischer, Facebook’s vice president of business and marketing partnerships, in a written statement. Last March, another controversy erupted after a Times of London story revealed ads were appearing alongside videos supporting terrorist groups. That, and additional reports that found ads on racist videos, triggered a boycott of YouTube by big companies including Coca-Cola Co. , P&G and Walmart Inc.
Google worked to assuage advertisers by improving the technology it uses to screen videos; setting a higher bar for videos that qualify for ads; adding more human reviewers; and giving marketers more control over where their ads appear. Last month, YouTube said it would have humans review every video in its “Google Preferred” service, a program that lets advertisers target the top 5% of content ranked by popularity. For months, ad giant Omnicom Group OMC +1.51% has had dozens of employees manually reviewing thousands of individual YouTube videos where their clients’ ads have run, to make sure the content is appropriate, according to people familiar with the matter. During an audit in October for GlaxoSmithKline PLC, the agency discovered that some of the drugmaker’s ads were appearing alongside inappropriate content on Google Preferred, the people said. One ad that should have been targeted to adults appeared in a video geared toward children that showed several young men playing with a young boy in a kiddie pool, while nursery rhyme music played. The agency dug further into the Heroes Team channel, one of the channels in the Google Preferred service, and found other content it considered inappropriate, including sexually suggestive videos with people dressed like Spider-Man and Elsa. Omnicom raised the alarm, and some of its clients temporarily suspended their ads from Google Preferred. YouTube eventually removed all ads from the Heroes Team channel, and the channel’s creator said he replaced the video content.For Mr. Pritchard, the YouTube crisis was a chance to look deeper at the ways he said P&G’s spending was going to waste on the site. In its tests, the company found that ads could land alongside a range of inappropriate videos, such as a young Portuguese boy shooting Teletubbies with a gun and an Arabic movie with terrorism themes, according to people familiar with the matter. “We kept testing things. We’d take a step forward, then something else would happen,” said Mr. Pritchard. In the past few months, P&G said it began to see improvements and started negotiating its return to YouTube. Google helped its case by assisting P&G when videos began spreading on social media showing teens eating or vaping Tide Pods, P&G’s liquid detergent packets. P&G said its plan to return to YouTube will involve selecting certain pre-vetted YouTube channels to build a “white list” for where its ads can run. In the U.S., its white list will consist of fewer than 10,000 YouTube channels, down from three million channels where its ads could appear before. The approach can lower the risk to a brand but puts the burden of figuring out how to avoid YouTube’s dark alleys on the advertiser, and companies will likely pay higher prices for more targeted ad buys, according to ad executives. HP Inc., which pulled ads from YouTube over inappropriate videos in November, is waiting to return until all the safety improvements are in place, said HP’s chief marketing officer, Antonio Lucio. The Palo Alto company was spending roughly $20 million on YouTube ads annually, according to a person familiar with the matter. At an event hosted by Omnicom on Thursday, Ms. Everson enumerated the steps Facebook has taken since the Cambridge Analytica scandal erupted. They include hiring forensic auditing companies to review apps that collected large amounts of user data before 2015, when Facebook tightened its policies, according to a person who attended the meeting. “We have to protect people’s privacy because at the end of the day, our business is built on the foundation of trust,” Ms. Everson said in an interview about Facebook’s data policies regarding advertisers. Facebook and Google have earned credit from marketers for forking over more measurement data to accredited third-party firms. The MRC, the measurement watchdog, has largely completed the first phase of its audit.